A few months back, I wrote a post on the group of bacteria known as Corynebacterineae. Today, I'm going to delve a little deeper into one of the best-known genera in this group, Mycobacterium. 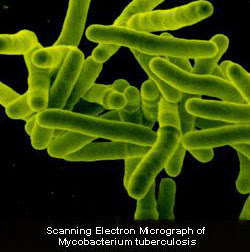 The most famous members of this genus, of course, are the human pathogens Mycobacterium tuberculosis (the cause of, well, tuberculosis - image above from here) and M. leprae (causing leprosy). Back home in New Zealand, though, the most significant species is possibly M. bovis, which causes bovine tuberculosis, and a whole host of other species infect various other mammals and birds. Mycobacterium also includes a number of non-pathogenic forms such as M. smegmatis. In culture, mycobacteria are clearly divisible into fast-growing and slow-growing taxa - phylogenetic analyses suggest that the slow-growing taxa (which include the major pathogens) may form a single clade (Devulder et al., 2005). Mycobacterium leprae is a very strange organism, even if we leave aside its apparent ability to survive on only two host species, humans and armadillos. As prominent human pathogens, M. tuberculosis and M. leprae have both been subject to genome-sequencing projects. The differences between the two species can only be described as remarkable. Bacterial genomes tend to be fairly streamlined things, probably because the rapid generation times and hence rapid evolutionary rates mean that non-functional genetic elements would soon be pruned from the genome. The genome of M. tuberculosis is no exception - ~91% of the genome is made up of protein-coding sequences, with only 6 pseudogenes (Cole et al., 1998). That of M. leprae, however, is an entirely different affair (Cole et al., 2001). Not only is it much smaller than that of M. tuberculosis (~3000 ORFs* in M. leprae as opposed to ~4000 in M. tuberculosis) but it also contains a much higher proportion of junk. Less than half of the genome appears functional, with a whopping 1116 pseudogenes. Even those genes that retain the appearance of functionality may not actually be so - comparative proteome analysis recovered only 391 soluble protein species in M. leprae, as opposed to ~1800 in M. tuberculosis. *ORF - Open Reading Frame. An ORF is a section of the genome that has characteristics suggesting that it might be a functional gene (such as an copy initiation site) but may or may not have been definitely connected to a functional product. (from Cole et al., 2001) (a) Diagram of the prolyl-tRNA synthetase gene (proS) regions in the genomes of Mycobacterium leprae (above) and M. tuberculosis (below). Arrows represent genes or operons, crosses indicate pseudogenes. Note the different positions of proS in the two species. (b) Domain structures of the proteins of the two species. Note the significantly different structure of the M. leprae synthetase, which may have been acquired through horizontal gene transfer from the eukaryote host. It is not hard to imagine how this situation arose. Many obligately parasitic organisms such as Mycobacterium leprae show reduction in functionality - why invest time and energy into producing something yourself when your host provides it ready-made? Leprosy (and hence probably the organism that causes it) may have originated quite recently - palaeopathological evidence does not indicate its presence prior to the development of urbanisation, and it is difficult to imagine how M. leprae, with its combination of obligate parasitism yet extremely low communicability, could have maintained a viable population without a dense host population (Pinhasi et al., 2006). It seems that with M. leprae we might be seeing reduction in action - the non-vital factors have lost their function, but their remnants have not yet been purged from the genome*. *It occurs to me that my wording in describing the loss of non-functional elements from bacterial genomes makes it sound like an active process - as if some factor in the organism's metabolism was directly seeking out and removing unneeded pieces of DNA. This is not necessarily the case. Even if the loss of pseudogenes and such was completely random, there would probably still be a tendency for populations to lose them over time, as bacteria with smaller genomes but no loss of viability would probably have a selective advantage over those with larger genomes because they would be able to grow and replicate faster. 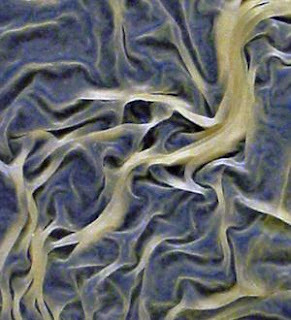 As regards the non-pathogenic mycobacteria, probably the best known is the aforementioned Mycobacterium smegmatis, shown above growing as a biofilm on water (image from ScienceDaily). This species is generally a soil bacterium, though it can cause opportunistic infections (generally in patients already suffering from immuno-suppression) - the name "smegmatis" refers to its initial isolation from human genital secretions. Because M. smegmatis, as a fast-growing Mycobacterium, is far easier to culture than the slow-growing pathogenic species, is has become widely used as a model organism in the study of mycobacteria. Cole, S. T., R. Brosch, J. Parkhill, T. Garnier, C. Churcher, D. Harris, S. V. Gordon, K. Eiglmeier, S. Gas, C. E. Barry, III, F. Tekaia, K. Badcock, D. Basham, D. Brown, T. Chillingworth, R. Connor, R. Davies, K. Devlin, T. Feltwell, S. Gentles, N. Hamlin, S. Holroyd, T. Hornsby, K. Jagels, A. Krogh, J. McLean, S. Moule, L. Murphy, K. Oliver, J. Osborne, M. A. Quail, M.-A. Rajandream, J. Rogers, S. Rutter, K. Seeger, J. Skelton, R. Squares, S. Squares, J. E. Sulston, K. Taylor, S. Whitehead & B. G. Barrell. 1998. Deciphering the biology of Mycobacterium tuberculosis from the complete genome sequence. Nature 393 (6685): 537-544. Cole, S. T., K. Eiglmeier, J. Parkhill, K. D. James, N. R. Thomson, P. R. Wheeler, N. Honoré, T. Garnier, C. Churcher, D. Harris, K. Mungall, D. Basham, D. Brown, T. Chillingworth, R. Connor, R. M. Davies, K. Devlin, S. Duthoy, T. Feltwell, A. Fraser, N. Hamlin, S. Holroyd, T. Hornsby, K. Jagels, C. Lacroix, J. Maclean, S. Moule, L. Murphy, K. Oliver, M. A. Quail, M.-A. Rajandream, K. M. Rutherford, S. Rutter, K. Seeger, S. Simon, M. Simmonds, J. Skelton, R. Squares, S. Squares, K. Stevens, K. Taylor, S. Whitehead, J. R. Woodward & B. G. Barrell. 2001. Massive gene decay in the leprosy bacillus. Nature 409 (6823): 1007-1011. Devulder, G., M. Pérouse de Montclos & J. P. Flandrois. 2005. A multigene approach to phylogenetic analysis using the genus Mycobacterium as a model. International Journal of Systematic and Evolutionary Microbiology 55: 293-302. Pinhasi, R., R. Foley & H. D. Donoghue. 2006. Letter: Reconsidering the antiquity of leprosy. Science 312 (5775): 846. Tuberculosis and leprosy are related to smegma?? WEIRD. Armadillos? That is odd. Is it as weakly contagious among armadillos as among humans? Is [leprosy] as weakly contagious among armadillos as among humans? I can't say. A quick search on the interweb suggests that leprosy is more prevalent in US armadillo populations than in humans (there's a brief report available here), but I couldn't say if that is due to greater ease of transmission, or simply because armadillos, unlike humans, don't isolate infectious individuals. Leprosy was apparently unknown in the Americas before European settlement, so it seems likely that it entered the armadillo population from humans - the risk of humans getting infected from armadillos is extremely low, but seems possible in at least some cases (there is a minimal rate of human infections in areas inhabited by armadillos in people who have never come into contact with another person carrying leprosy). I haven't been able to find why armadillos are susceptible - I can't help wondering if nine-banded armadillos are really the only animal other than humans susceptible (how many other species have been tested? ), and one site refers to reported infections in chimpanzees and mangabeys but without a source. A number of sites mention a supposed connection with the relatively lower body temperature of armadillos, but again, no source. It's also probably a factor that leprosy is extremely slow-growing (doubling time of 27 hours! ), and so infections take a number of years to develop. Most mammals simply wouldn't live long enough to develop leprosy. "Leprosy was apparently unknown in the Americas before European settlement, so it seems likely that it entered the armadillo population from humans - the risk of humans getting infected from armadillos is extremely low,"
I would think that works in reverse, too. How much contact do armadillos and humans have? Usually, it would be humans capturing armadillos for food, so that the animal wouldn't have a chance to develop disease, nor pass it on to its fellow armadillos. But still, if leprosy didn't show up here until the Europeans did, then ... Intriguing. Which is my point. There still seems to be a minimal risk of armadillo to human transmission. If leprosy was present in the armadillo population before European settlement, then I would expect it to be known in the human population if only at very low rates. Of course, it would help if we really had any idea how leprosy is transmitted between members of the same species, let alone members of different species. The main suspect for transmission between humans seems to be via the respiratory system - Mycobacterium leprae grows well in the mucous membranes of the nose - but this is far from conclusive. Transmission from armadillos to humans (or vice versa) would require a fair amount of direct handling, I suspect. There seems to be an idea out there that humans can catch leprosy by eating insufficiently cooked armadillos, but I've no idea if this has been properly studied. Do we even know if there were leprous armadillos before Columbus? "Of course, it would help if we really had any idea how leprosy is transmitted between members of the same species, let alone members of different species." It would. It's a fascinating disease; so long studied, yet so little known. With the new tools available, this may change, though. I'm here because I'm writing a thesis on bacteria that eat toxic waste, esp. coal tar, and the biogeography of a pair of aromatic dioxygenase genes, one of which (nidA) is carried by several members of the mycobacter (PYR-1, frederickburgense, flavesenens)- which, unfortunately for me, have never killed anyone. Mycobacter is in the Actinotobacter group, widely distributed soil bacteria, responsible for a lot of catabolic soil activity, but whenever I research my organisms of interest, I have to wade through article after article about what (#@**@ M. tuberculosis or M. leprus. Weirdly enough, actinobacter appears to be a very confused clade. I covered another group of actinobacteria here. I wouldn't have thought that actinobacteria were any more confused than any other bacterial group. Prokaryotes as a whole are just a lurgy mess :-). Armadillos are more susceptible due to having a really low body temperature. That's why leprosy eats your extremities first- they're cooler, and it doesn't do as well in warmer environments. They used to use long-eared rabbits as research animals, but evidently, armadillos are even cooler. literally. So rabbits can carry leprosy too? Just one more piece of evidence that rabbits are evil.